Jeanne Dielman present a reissue of The Archie Shepp & Bill Dixon Quartet, originally released in 1962. 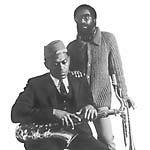 The debut as a leader for both Archie Shepp and Bill Dixon, two formidable members of the free jazz and avant-garde elite. Rounding out the quartet are bassists Reggie Workman and Don Moore, and drummers Paul Cohen and Howard McRae, each on various tracks. While the album undoubtedly swings, this piano-less quartet definitely prefigures the trailblazing free jazz work the two leaders would be involved in for the remainder of the decade, and beyond. An essential piece of early free jazz. "This is the second album from Exploding Star Orchestra and the first to feature free jazz legend Bill Dixon. Bill Dixon (trumpet) is a seminal free jazz figure whose career has spanned over 40 years. He organized the influential October Revolution in Jazz in 1964, co-founded the Jazz Composers Guild, and has played with the likes of Archie Shepp, Cecil Taylor, and William Parker. His playing has had huge influence on many free jazz trumpeters. Rob Mazurek (cornet) is a prime figure in the vibrant Chicago sound scene, having lead and performed in Chicago Underground, Isotope 217, and Mandarin Movie. Exploding Star Orchestra is his latest project which he began in 2005. Also featured on the album are John Herndon and Jeff Parker (Tortoise), Nicole Mitchell (Frequency), Matthew Lux (Isotope 217), Damon Locks (The Eternals), in addition to many of Chicago's most exciting improvisers."